Hi, I’m Christa from Kempsey in NSW and joined the walk in St Lawrence on the last day of July. I was lucky that to begin with, we walked on the sometimes elusive, but always quiet and natural Bicentennial Trail. It is unseasonally warm, and on the Bruce Highway it seems even hotter. While walking on the edge of such a busy the road, the mind has to split two ways. One half attempts to block out the traffic as much as possible, the other half stays totally alert to maintain a save distance from the oncoming trucks and to never miss to return the friendly waves of drivers. The settlements we stayed at have shrunk over the years from lively townships to places with under 100 residents. St Lawrence has shrunk from a town with several thousand residents. It used to have a port and meatworks. Ogmore has got exactly 32 houses left with 52 residents. The president of the resident’s association Brian Kennedy described it as Queensland best retirement village. There are no children in Ogmore, no shop, no pub. Marlborough still has a pub, a couple of shops and a motor mechanic, but it too has got the past and the memories of a much larger town. To my surprise, the people we meet are well informed about what is happening to the Great Barrier Reef and they are worried. Men, who at first appearance seem to be only interested in a cold beer, grey nomads I assume to be mainly interested in the comforts of their motor homes, may not consider to join us, but they are grateful that we take action and encourage us to continue our walk to save the reef. Besides interesting conversations at the rest places there are inspiring encounters on the road. The most spectacular and energising meeting happened on 3 August somewhere between Marlborough and Kunawarara. 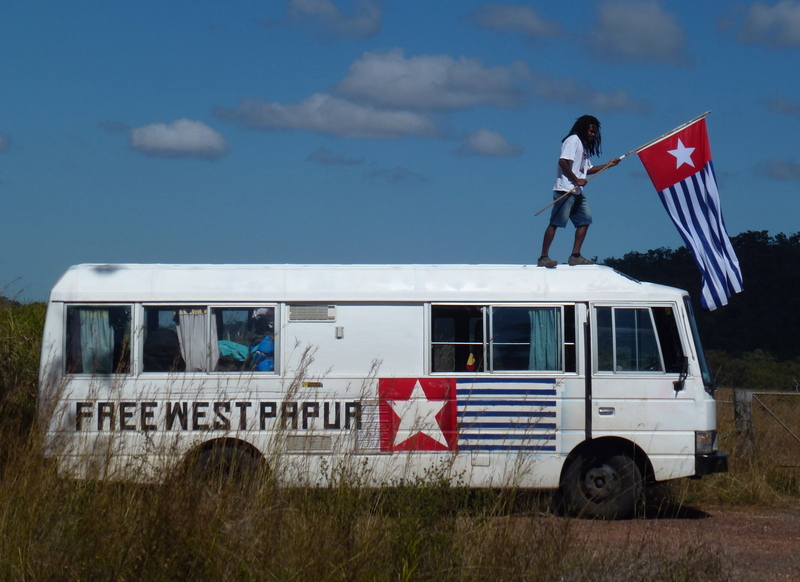 We, going south to save the reef, met with a large group of activists driving north to get publicity for the freedom of West Papua. 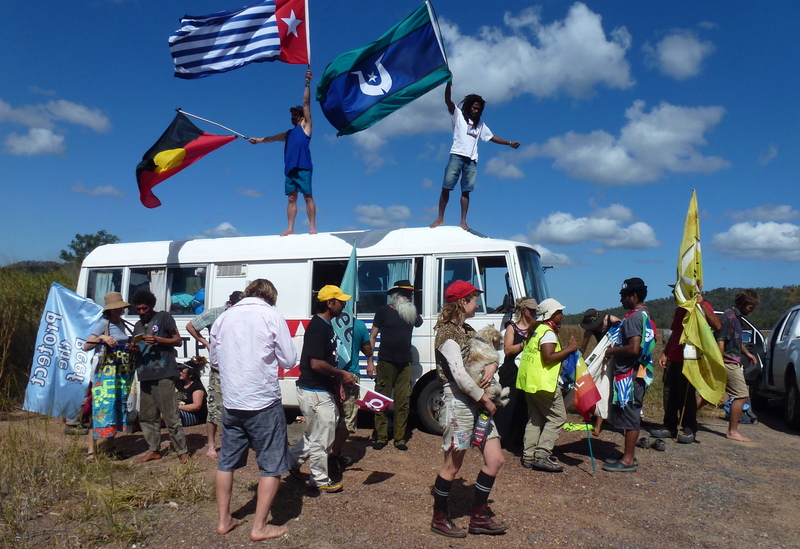 They started at Lake Eyre and are planning to take a flotilla of boats from Cairns to West Papua, a truly brave venture. It is difficult to get any media coverage for the totally oppressed people of this country ruled by Indonesia and exploited by American and international mining interests. The group is colourful indeed. Amongst them are several Papuans, an Aboriginal Elder from the Illawarra, a beautiful young transgender person, Izzy, the rapper I have heard six years ago at the Peace Convergence and Ronny a man belonging to the Torres Straits, but grown up in Brisbane who is on his way to see his home for the first time in his life. Large West Papuan, Aboriginal and Torres Strait Island flags flap in the wind. Ronny explains his flag to me. I had been aware of the blue for the sea, green for the islands, but I had never noticed the black line for the people nor known that the white shape in the centre is a head dress and the points of the star equal the number of islands. We mingle by the side of the road. There is not much time to exchange our stories and information. 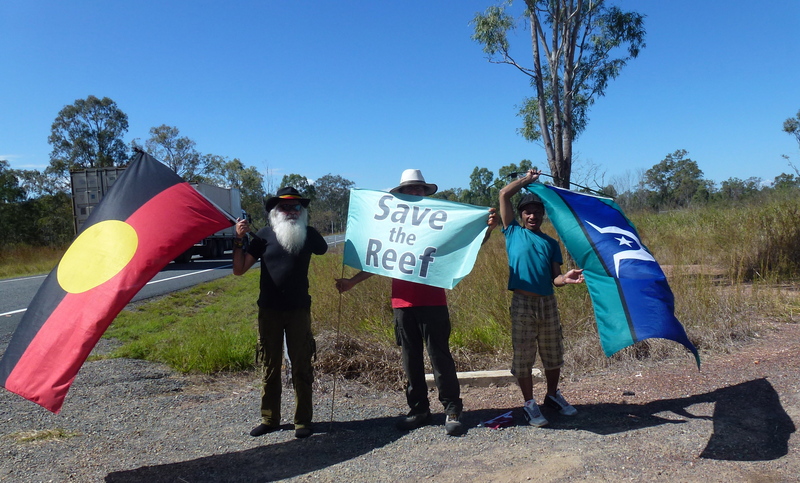 The group travelling north wants to reach Townsville where they are expected for a public event. We continue at a much slower pace, but also with time constraints, towards Rockhampton and Gladstone. I feel invigorated by the encounter. On the same day, two motor cyclists on their way from Melbourne to Darwin stop to find out what we are doing. And then there is also an encounter with a cyclist pedalling from Sydney to Cairns, a science teacher from a city with a population of 6 million in China. Like us, he is enthralled by the clear blue sky. That day, the Chinese cyclist was the last encounter on the road before we reached the roadside store where we would stay for the night and where Donna welcomed us with a delicious jug of freshly pressed, cold orange juice. We miss you and it is great that you can continue to participate through the website.